Capital Credits - It's the Cooperative Difference! Every member who purchases electricity during a year in which margins are earned is allocated capital credits. The amount of credits earned is based upon the amount of capital contributed to the co-op through payment of the monthly bill. The more electric service bought, the more capital credits earned. The sum of a member’s bills for the year is multiplied by an allocation factor to determine earned capital credits. The allocation factor varies yearly, depending on the success of the co-op. Since credits are a member’s share of the margins, no credits are allocated for a year without margins. Margins earned represent an interest-free source of operating capital by you and the rest of the membership to the co-op. This capital allows us to finance operations and new construction, with the intent that this capital be repaid in later years, as the Board of Directors authorizes its retirement. Capital credits of a deceased member may be paid at a reduced present value without waiting for a general retirement. Members who move off cooperative lines should call the office with a current address for future credits to be returned. Sometimes capital credit checks are returned to us because inactive members forget to notify us when they move, or family doesn't contact us if a member dies. We do our best to find new addresses or next of kin. You can help us by reviewing these listings of members owed capital credits and asking the member, or executor of his/her estate, to contact our office. 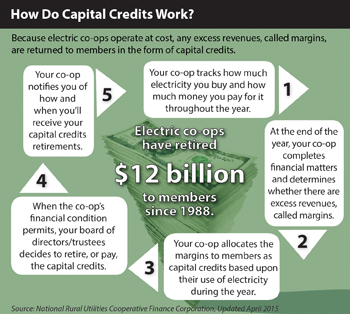 Menard Electric Cooperative has returned $10,185,990 in capital credits to our members.